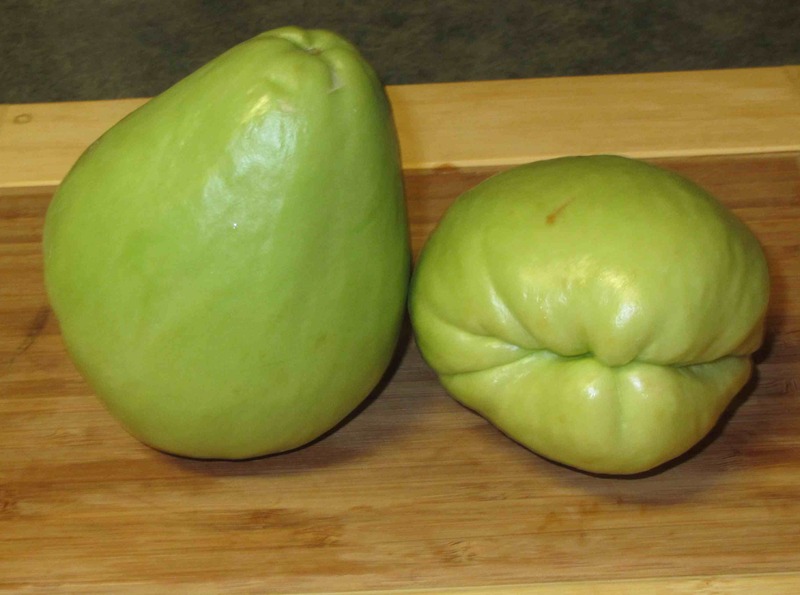 Chayote are native to Mexico but are now cultivated and used worldwide. They are also known as ‘Christophenes’, ‘Pear squash’ and ‘Vegetable pears’, but the most common alternate name I have come across is ‘Merliton’. Although I have only seen the fruit part of the plant, I gather that the stems, roots and leaves are also eaten. The seeds inside the fruit are also edible, but most people choose to discard them. Although Chayote are botanically classified as a fruit, they are not sweet and thus are used more as if they were a vegetable. They are exceptionally versatile and are often eaten raw (along with the edible skin) and feature in salads as well as salsas. In hot dishes, many recipes suggest only cooking them lightly so that they preserve something of their crisp texture and they are popular in soups, stews and stir-fries. In Indian cookery, they are used in curried dishes and are often added to dal preparations. 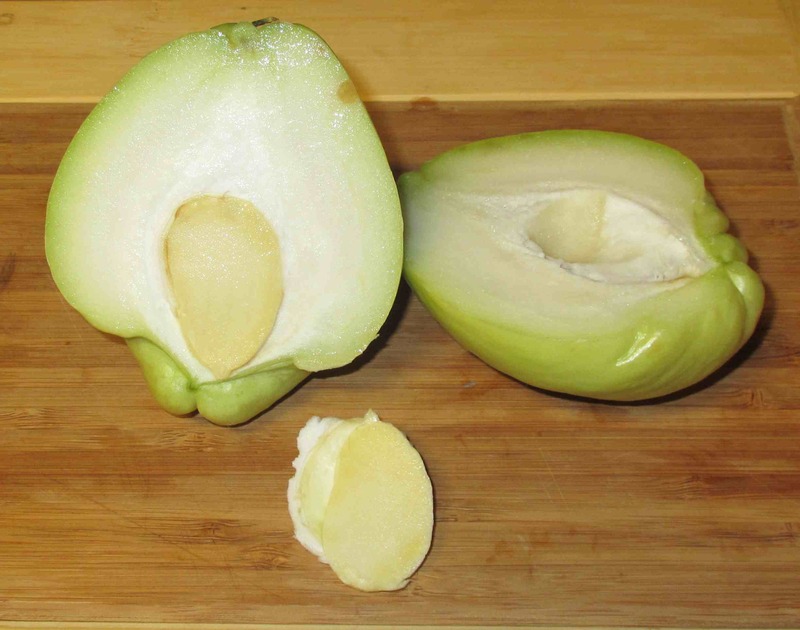 On opening, the fruit reveals a homogenous, firm white pulp and a fairly large seed. The seed pops out quite easily and is surrounded by a soft, somewhat velvety textured covering. This covering can be scooped out and discarded, if desired, but it is perfectly edible. The texture of the flesh is a little like an apple, but not quite as succulent. The flavor is very much like a somewhat nutty cucumber with faint woody notes and is very pleasant. I also tried the seed and it, too, is quite tasty. Both in texture and flavor it is very much like biting into a raw lima bean. I’m very intrigued. I’ll give it a try. I never heard of a chayote before. They’re sort of cute–they look like a cross between an apple, a pear, and a clam. I bet your recipe will turn out very nicely. But then again, I’d probably eat an old shoe if it were cooked with ginger, shrimp and salted black beans. We also call this “hand gourd,” or something like that because it looks like two hands, with the fingers curled under, put palm-to-palm. I look forward to seeing what you do with it! I’ve had these in Mexican food but never cooked with them–I assumed the inside was like a zucchini! In Australia they’re called choko and I love them. I love learning about new fruits and veggies. I don’t think I have ever seen that item in Asia but will keep a look out for it. I am thinking this sounds like a yummy addition to savory dishes and looking forward to see what you make with it. Ouch, $2.00 for one choyote, that is pricey. It is delicious though. I’ve never heard of these. From their appearance, I wonder if they’re in any way related to jicama? I am amazed at the variety of foods that your local stores carry! Let me be honest: World’s most boring vegetable. It’s like a tastless apple. On a par with jicama for dullness. Sorry. We eat these with chicken soup in Mexico. I LOVE It! We lived in Santo Domingo for several months and chayote was usually served as a side dish with many meals. I love that even though you paid $2.00 for each chayote, you had them available in your remote area. Yummy! I have a Cajun recipe for stuffed baked merliton!